Take the hard work out of transporting heavy-duty vehicles, machinery and equipment — just leave it to the professionals instead. Our certified team has years of experience delivering towing services to customers across Oakland and Hayward. We’ll take your property from one site to another with the utmost speed, efficiency and commitment to quality. Your property will be kept safe and secure on the road, no matter the time, weather or route. What Heavy Duty Vehicles does Silverline Towing Transport? This diversity allows us to cater to both businesses and civilians on a daily basis. Maybe you run a construction firm and have ready to be delivered to a site. Perhaps you manage a car dealership and need a couple of SUVs to be transported. Or you might have just bought a boat and have the perfect spot for it. In any of these situations — and many more — Silverline Towing is the only company to call. What Heavy Duty Machinery and Equipment do we Tow? Each of the above has a vital role to play in different types of work, and you need them to arrive on time. Silverline Towing prioritizes punctuality in every single case — rest assured, we’ll bring your heavy duty machinery or equipment exactly where it needs to be, exactly when you need it. We all have different schedules. Countless businesses operate around the clock. People work late shifts or right through the night. Your company or lifestyle depends on having access to the right vehicles, machinery or equipment — and we respect that. That’s why Silverline Towing is here to help you 24 hours a day, 7 days a week. No ifs, ands or buts. Just pick up the phone and call when you’re looking for local heavy duty towing in Oakland or Hayward. 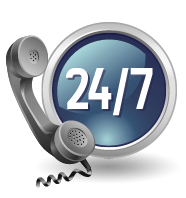 Our 24/7 service is always delivered with fast response times too. If you have a heavy duty towing emergency, or even just a tight deadline to stick to, Silverline Towing will get to you as soon as we possibly can. As our technicians are local to the Oakland and Hayward area, they know the quickest ways to reach you. We’ll transport your heavy-duty vehicles, equipment or machinery to your unique schedule, for maximum convenience. Our heavy duty towing service is available at an affordable rate for all budgets. We believe in keeping our costs as competitive as possible, catering to commercial and domestic clients alike. Our pricing is honest and fair, even for heavy duty towing: you can enjoy real peace of mind knowing there are no hidden fees to worry about. Silverline Towing is passionate about being part of the local community, and we aim to build lasting relationships with our customers. We’ve established a reputation for excellence — and we work hard to maintain it. Silverline Towing’s heavy-duty towing is just one of many services in our portfolio, alongside gas deliveries, battery replacements, car lockout solutions and more. We work with only the most experienced technicians with extensive training, all qualified to transport your heavy-duty vehicles, equipment and machinery. Want to hire our heavy duty towing experts? Call us now on (510) 500-5665 to chat with a member of our friendly team!